Global Reflections 2018: Spirit of Community will open on June 13th, with a special reception and chance to meet the nineteen emerging and established artists on June 21st at 5:30pm. The reception is free and open to the public with RSVP (212-459-1854 or email info@communityworksnyc.org. 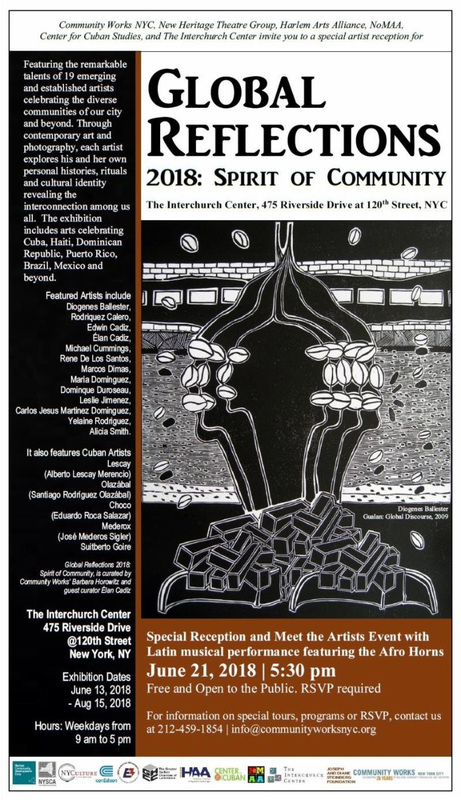 The exhibit is curated by Community Works, Barbara Horowitz and guest curator Élan Cadiz, and will be on view to August 15, 2018. The Interchurch Center is located at 475 Riverside Drive at 120th Street.